Note: UCLA Endocrine Surgery and the Association of Endocrine Surgeons are both excellent sources of information for learning about the various reasons calcium may be high. As primary hyperparathyroid disease is the most common cause of high blood calcium, and that was our experience, Parathyroid Peeps is only addressing this causation. Normal ranges for serum calcium are age-dependent. Yet labs will often give a normal range for “all humans” and that normal range may go up to 10.5 or even 10.7 mg/dl. Why? We have learned that during the teenage years we grow lots of bone and our bones become more dense. At this time we have more calcium in our blood because we are “turning over” and “remodeling” our bone structure. By the time we get to be 30 years old, the calcium levels decrease normally at different rates for each person. By the time we are 40 we should never have calcium levels above 10.1. Unfortunately not all labs report serum calcium base on age, thus delays in diagnosis occur. As a result of the way ranges are reported, patients may hear from their physicians that their serum calcium is “normal” when it is actually too high for their age. Therefore, based on our own experiences and those of others, it is EXTREMELY important to ask for copies of your lab values to see the results for yourself. According to experts, those whose calcium values fluctuate and/or exceed the upper limit for their age, should be evaluated for primary hyperparathyroid disease. High serum calcium (normal = 8.7 – 10.1 mg/dl (for a mature adult) – Link here to use a hypercalemia calculator to determine the high range of normal for your age. According to the experts at the Norman Parathyroid Center (NPC), persistent calcium levels 10.1 and above (in a mature adult) is almost always a parathyroid tumor. Though she eventually presented classically, read how Barbara’s diagnosis was delayed as PTH tests were, for years, NEVER ordered when calcium values were high. Approximately 20-25 percent of cases don’t present classically. Normohormonal presentation: Calcium is high, but PTH is still within the normal range. This normohormonal presentation is frequently misunderstood and often delays diagnosis. PTH levels do not have to be high to diagnose primary hyperparathyroidism. Almost 20% of people with a large parathyroid tumor will have all normal PTH levels. Another 30% have PTH levels that are mildly elevated sometimes and normal sometimes. Another 20% will have only mildly elevated PTH levels. It is a minority of patients who have high calcium and high PTH levels at the same time. If you have high calcium and PTH levels at the same time, then you have had a parathyroid tumor for six or seven years before somebody figured it out. The concept that you need both high calcium and parathyroid hormone levels to make this diagnosis is incorrect. High calcium levels by itself assures the diagnosis at least 99% of the time. PTH levels add almost nothing to it. Read about Joyce’s journey of getting diagnosed with a normohormonal presentation. Normocalcemic presentation occurs when calcium is in the normal range, but PTH is elevated. As we understand, additional lab tests including ionized calcium and urine calcium may be helpful in making the diagnosis when the presentation is not classic. Total calcium level is often measured as part of a routine health screening as it is included in the comprehensive metabolic panel (CMP) and the basic metabolic panel (BMP). Check that yours is in the tight range that is normal for your age as discussed previously. When parathyroid disease is suspect, Ionized Calcium is considered by experts to be the “gold standard” for rechecking calcium levels. Parathyroid Hormone (PTH) levels are not generally tested unless calcium is found to be high. Based on patient experiences, doctors often do not order a PTH test or understand the relationship of Vitamin D to Calcium when a patient has primary hyperparathyroid disease. Therefore, it may be necessary to request that PTH and vitamin D be tested at the same time. “When an abnormal total calcium result is obtained, it is viewed as an indicator of an underlying problem. To help diagnose the underlying problem, additional tests are often done to measure ionized calcium, urine calcium, phosphorous, magnesium, vitamin D, parathyroid hormone (PTH) and PTH-related peptide (PTHrP). Both PTH and vitamin D are responsible for maintaining calcium concentrations in the blood within a narrow range of values. Find out what tests your physician is planning to order to help ensure a proper diagnosis is made. Do I need both to be checked and should calcium be adjusted for albumin? According to Dr. Deva Boone from the Norman Parathyroid Center…. There are two measures, serum calcium which is normally in the 9’s mg/dl (if a mature adult age 30+) and ionized calcium. Ionized calcium is part of total calcium. Calcium can be “free” in the ionized form, or bound to protein (not ionized). The most abundant protein in your blood is albumin. If you have a normal albumin level (most relatively healthy people have normal range albumins), then the total calcium level is very accurate. If your albumin level is high, then the total calcium level is still very accurate – and you cannot correct for a high albumin level! The correction for albumin comes about because people with very low albumin levels (these tend to be people in the intensive care unit who are very sick) have falsely low total calcium levels. You have to “correct” the “low” calcium level for the very low albumin level. This is not an exact science, and so if you do have someone in the ICU and very ill and you are worried about the calcium, you can check an ionized calcium level, which will be more accurate in that situation. For most adults who are not in the hospital, a total calcium level is very accurate, and you usually don’t need an ionized level. The CalciumPro app available from the Norman Parathyroid Center which can be downloaded onto an iPhone, iPad or Android, can be a helpful tool to assist in diagnosing this disease. By entering your blood calcium, PTH as well as your vitamin D levels from copies of lab results ordered by your physician that you have requested copies of, you will get a visual image of your chances of having this disease (from very unlikely, unlikely, possible, likely to very likely). 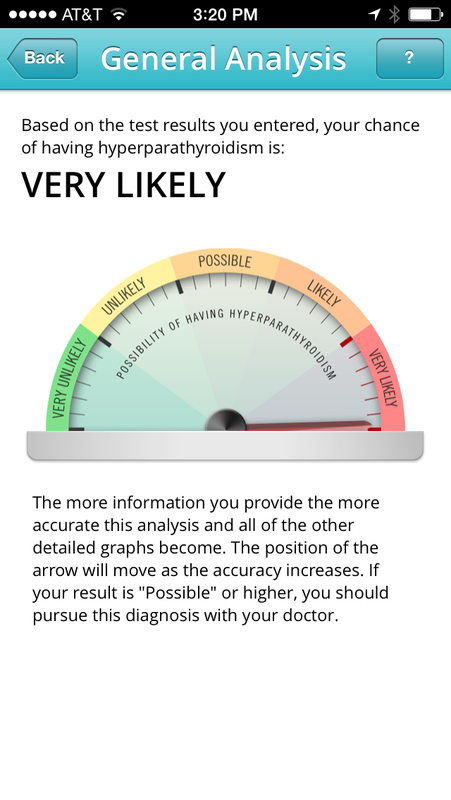 The app will also show you your risks for other diseases like osteoporosis, kidney stones, heart disease, heart rhythm problems, certain cancers, and high blood pressure. To identify the source of the excessive hormone secretion, medical imaging is often performed. There are very different opinions as to the effectiveness and usefulness of imaging as a diagnostic tool. Diagnosis and/or referrals for surgery however are often delayed due to the lack of a visual confirmation of an adenoma resulting from scans. In our experience, a scan was not required prior to being diagnosed and accepted for surgery.